INDIANAPOLIS – While the importance of trusted relationships between patients and their physicians is taken for granted, little attention has been given to the relationships among physicians themselves. 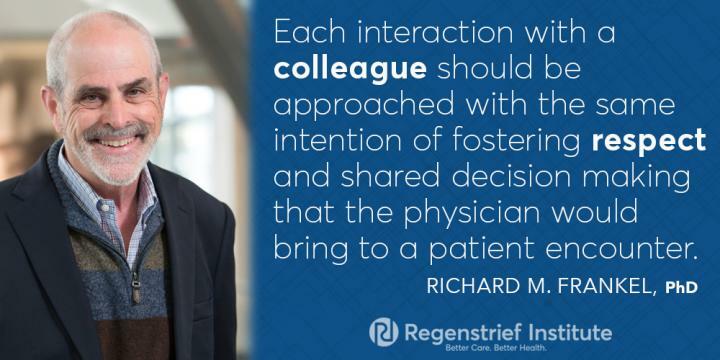 Yet the interactions between, for example, a patient’s primary care physician and cardiologist or between a patient’s pediatrician and an oncology team, are essential to the safety and quality of care for patients and the resilience of physicians and other healthcare professionals. In a Viewpoint article,” Physicians’ Trust in One Another,” published online March 22 and in the April 9 print edition of JAMA, authors Richard M. Frankel, Ph.D. of the Regenstrief Institute; Virginia P. Tilden, Ph.D. of Oregon Health & Science University and Anthony Suchman, M.D. of the University of Rochester write that while trust in the physician to physician relationship hasn’t been closely examined, it appears increasingly to be at risk. Where does this apparent lack of trust originate? Dr. Frankel looks back to the competitiveness of medical school and as medical school ends, the competition for residencies. Do those who enter the most selective (and in the United States, the most highly paid) specialties look down on their primary care colleagues? Do specialists have a lack of trust in their primary care peers’ judgements simply because they chose a less specialized medical career like pediatrics or family practice? Noting that the use of electronic medical records and the development of specialties such as hospital medicine have removed much of the interpersonal interaction that used to take place between primary care physicians and specialists — the phone call to discuss a case or the hallway update — Dr. Frankel voices concern that, in addition to having a potentially negative impact on patient care, the lack of interpersonal interaction may also be contributing to the increase in physician burnout and decreased resilience. In addition to his appointment as a Regenstrief Institute research scientist, Dr. Frankel is a professor of medicine at Indiana University School of Medicine and a research sociologist at the Center for Healthcare Information and Communication at the Richard L. Roudebush VA Medical Center.